Your HomePod can do more than kick out the jams. More than you may realize. HomePod is primarily a music playback machine. And it’s got Siri, which means it can do obvious things like set timers, take notes, and tell you what the weather is going to be tomorrow. But it can do more. It’s no Echo or Google Home in its flexibility, but HomePod has a few neat tricks up its... um...power cord. Here are some of the things you might not know HomePod can do. The same principle applies to music tracks. “Skip forward” and “next track” are obvious commands, but to can also say, “Skip forward 42 seconds” to get past the boring intro or zoom straight to the chorus. Don’t remember One Foot in the Grave is the name of Beck’s first album? No problem, you can simply say, “Play Beck’s first album” to hear it. Or if you want to hear a song that escapes you, try being generic. For example, “Play that Run DMC song with Aerosmith” will cue up "Walk This Way." There are lots of subgenres of music, too, such as k-pop, Chicago blues, smooth jazz, and zydeco. 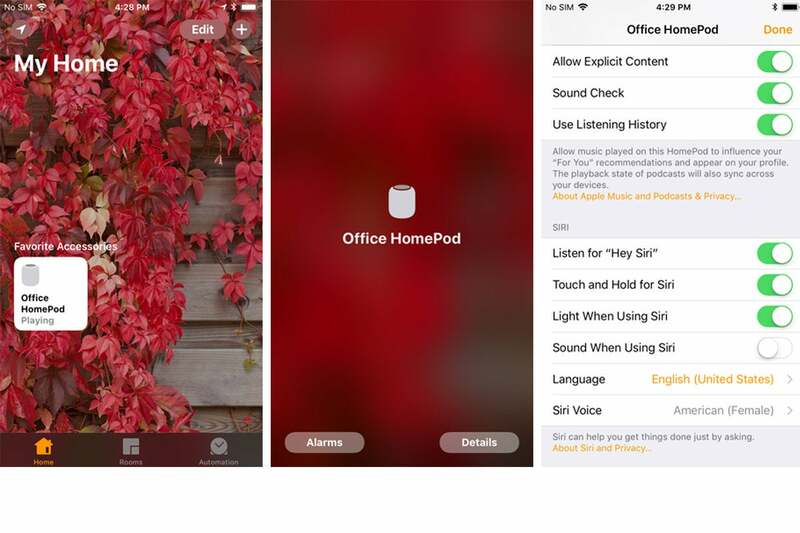 HomePod’s settings can be found in the Home app. If you don’t want HomePod to affect your suggested music, just turn off the listening history. It’s rather annoying that HomePod doesn’t recognize different voices. Even if you turned off Personal Requests, your family members can still inadvertently mess up your music recommendations with a flood of kids music or tween bands. Fortunately, you can turn off music recommendations on your HomePod, so the songs played there won’t affect the “For You” recommendations on your Apple Music account. 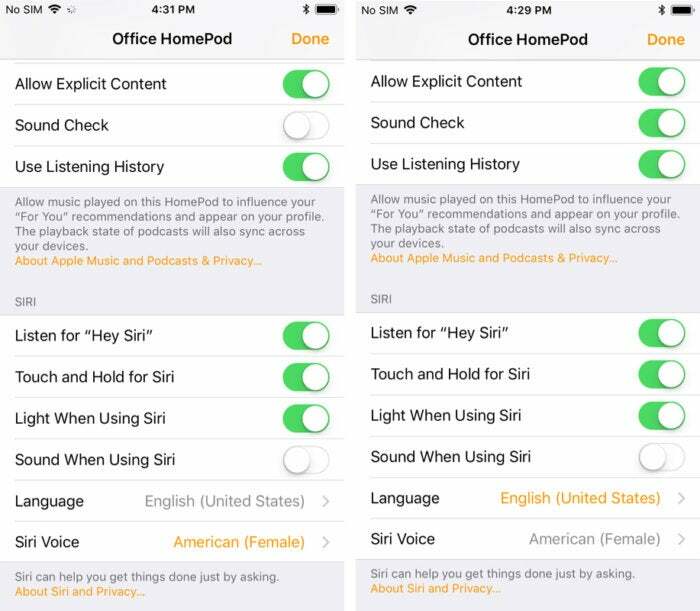 It’s not an ideal solution, but it may be the best option you have until Apple adds voice identifications to HomePod. You can’t use Siri to start a phone call with HomePod. That’s a bummer. But you can use HomePod as a very sophisticated speakerphone. It’s not the most elegant solution, but when you’re in a call or about to accept one, simply tap the “audio” button and choose HomePod as the source. It’s the same as you would do to use a Bluetooth headset. 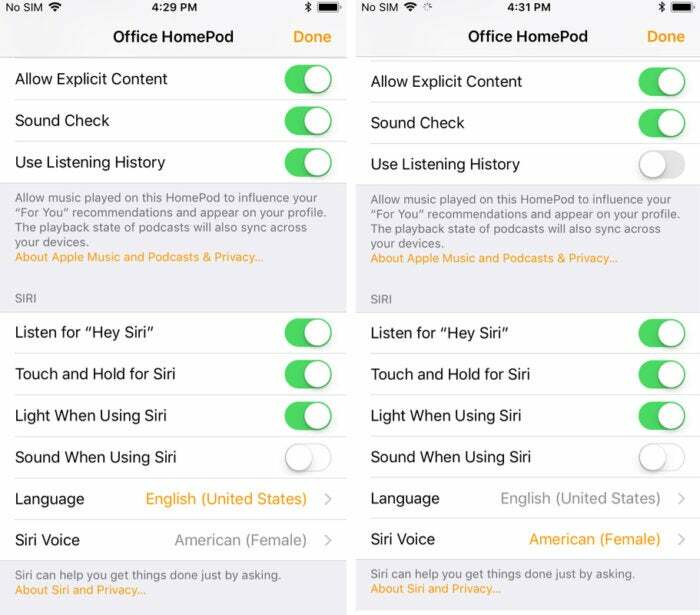 You can change the accent and gender of Siri on HomePod. 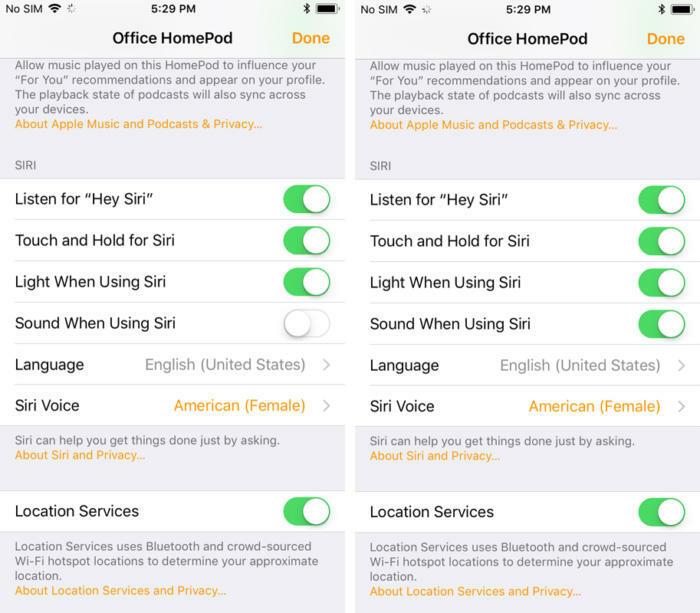 Siri’s voice is female by default, but you can change the accent and the gender inside the Home app. 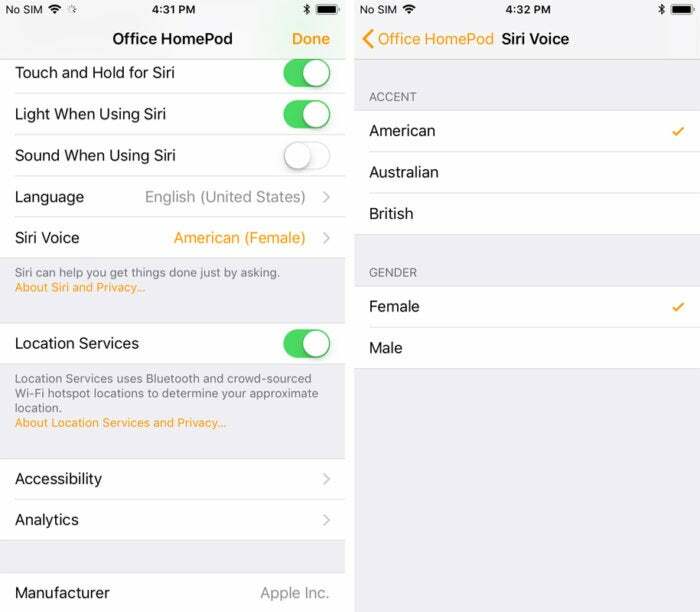 Just head over to the Siri Voice tab and you can select a new accent (American, Australian, British) or change the gender from female to male. Siri on HomePod is missing a lot of what makes Alexa and Google Assistant so good on those other home speakers. But it’s surprisingly helpful in one area: restaurant reviews. Just ask Siri to “Find a good pizza place near me,” or “What’s the best sushi restaurant in San Francisco,” and it will oblige, even telling you far away it is from your home and how many starts it gets in Yelp. While you can’t create new playlists on HomePod, you can add songs to ones that already exist. Just ask Siri to “Add this song to my Running playlist,” and it will appear on all of your devices. However, if you want to delete a song you’ll need to head to Apple Music on your device to do it. One of the few tasks Siri does well on HomePod (aside from playing music) is setting timers. But after you set it, you don’t have to wait until it goes off. Just ask, “Hey Siri, how much time is left on my timer,” and it will tell you. HomePod has a robust set of accessibility settings. 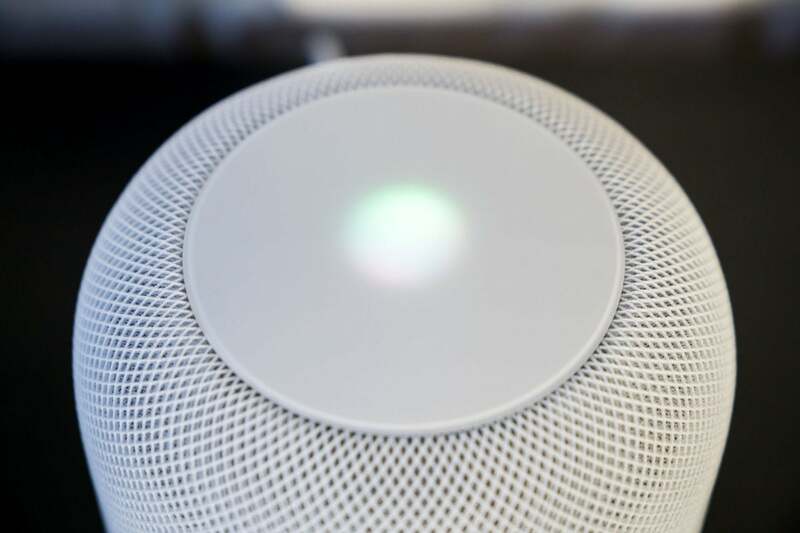 Just like iOS, HomePod has built-in features that will read the touchpad controls aloud for people with impaired vision or tweak the sensitivity. To turn it on, head over to the Home app and select the Accessibility tab. Inside you’ll two options for Voice Over and Touch Accommodations. There are a few settings inside each, including speaking rate, hold duration, and tap assistance. You can limit the volume of tracks by turning on Sound Check in the HomePod settings. Just like iTunes and Apple Music, HomePod includes a feature that will normalize the volume across songs to avoid inconsistent levels when listening to a playlist. Just go to the HomePod settings in the Home app and turn the Sound Check toggle green. Whenever you stop playing a song on HomePod it’s not actually off, it’s just paused. So when you want to start playing music again, just say, “Hey Siri, play,” and it will begin playing from the point where you stopped it last time. When you ask Siri the name of the song that's playing, it will tell you, as well as the artists, album, release date, and lots of other information about it. However, when you ask it to identify a song that's playing on another source, it'll tell you that it's only able to ID songs that it's playing. That's not entirely true. Instead of asking, "Hey Siri, what song is this," say, "Hey Siri, Shazam this," and it will listen to whatever's playing and tell you the name of the tune. Flip the Sound when using Siri toggle green and you’ll hear a tone to let you know Siri is listening. Siri on HomePod is remarkable good at hearing commands, but if you want to know that Siri has responded, you can add an audible tone just like on your iPhone. Inside the Home app there’s a toggle for “Sound when using Siri,” which will play a bass note when it starts listening.